Pools,Pool, Spa, Pond and Water Feature Products, Chemicals & Advice Water Testing We are the local leaders in water balancing and problem solving. Our Zodiac testing equipment is more accurate and more reliable than ever before. Simply bring 500ml of water from your pool or spa and we can provide you with a free computer water test, this will result in you receiving a step by step easy to follow instructions to perfectly balance your pool for your pools health and more importantly your family’s health. Statewide! Although our store is located in the north of the state we service the whole State. We freight goods Statewide. Adam Poulton visits the south of the state weekly and the north east fortnightly doing a lot of service and maintenance work, including insurance work. He can be contacted via our store. 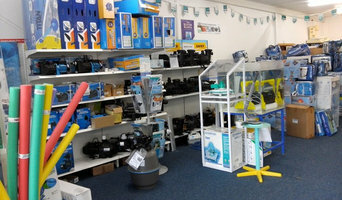 Warranties We are authorised by most major pump manufactures including Zodiac, Onga, Waterco, Bianco and Davey to carry out warranty work and can repair all types of pumps. Commercial Pools Over the past few years we have put new chemical dosing systems into several commercial pools and currently work with many commercial pools over the State in the every day water balancing, chemicals and equipment of there pools. Our commercial customers includes Aquatic Centers, Casinos, public and private Schools and many Councils. Residential Pools No pool is too small or too large for us to deal with. We deal with the larger cement or fiberglass pools, above or in ground metal sided pools down to the smaller Intex or Bestway pools that we stck filters and parts for. We look after water balance, equipment sales and repairs, pool sales and installations. Ponds We also deal with water features and ponds, we sell pond liners, pond pumps, pond filtration and pond algaesides. Australian and New Zealand pool builders continue to push the boundaries in terms of design. Infinity pools, for instance, are no longer reserved for top-end holiday resorts; and lap pools aren’t standalone additions to a backyard. You can now get your feet wet in an infinity pool, lap pool or swim spa that is an integral part of your Launceston, Tasmania home design. And, with improved technology, there are more low-maintenance, energy-efficient and sustainable options available. Whether you’re at the beginning stages of planning a pool or spa, renovating an existing one, or just need upkeep assistance, there’s a Launceston, Tasmania pool specialist on Houzz who can help. After council approval, your contractor will commence construction, which can take up to two weeks for a fibreglass pool and longer for a concrete pool. Some companies in Launceston, Tasmania extend their services to pool fencing, landscaping and the coordination of trades for filtration and heating equipment, as well as pool cleanings, water testing, renovations and equipment replacement or repairs. Here are some related professionals and vendors to complement the work of pools & spas: Garden & Landscape Supplies, Landscape Architects & Designers, Building Project Managers, Landscape Contractors & Gardeners, Solar Power Contractors. Find a Launceston, Tasmania swimming pool and spa expert on Houzz.